I’m sure you can agree, a portable cooktop stove must have the right cooking controls, adequate cord length, and the right number of burners. That was our top criteria for selecting the best portable cooktop stove. If you’re ready to get cooking, the Waring Portable Double Burner Cooktop scored high marks in all categories and is our top pick. Portable Cooktop Stoves are popular appliances and are used under a wide range of circumstances. Some consumers like to have an extra burner when entertaining guests over or cook for holiday meals. Summer cooking allows you to bring the burner outside and keep the house cool during hot summer evenings. Others use the cooktops to keep food warm by placing the cooktop on the table, during entertaining events. Other popular uses are having a cooktop at work to cook fresh meals for lunch, in hotels while traveling, using one or two in an RV, for camping, or other outdoor events. College students and singles love them for dorm use or when living in a small apartment because they do not take up much space, are economical, and easy to store. Some of the advantages of a cooktop stove is that is does not heat up the kitchen like stove burners do. This is especially true with induction cooktops. It provides an extra burner when cooking large meals and is very portable. The cooktops are small and compact. They do not take up much room to store and can be carried with you almost anywhere. Cooktops are a very popular choice among kitchen appliances due to their compact size, versatility and portability. This has created a huge market and a large number of manufacturers creating a full line up of models to choose from. You can choose traditional electric or induction cooktops, which are the most popular choices. They also come in single and double burners, depending on your needs. Through this review you will be able to buy with confidence and select the best products at the best prices for your home cooking needs. The Waring DB60 Portable Double Burner Cooktop is a top pick because the burners are able to heat up to a level that will cook most foods. The cast iron burner plates provide a slower heat up time but once the desired temperature is reached the burner will maintain that temperature and will heat and cook foods evenly. The brushed stainless steel exterior looks great in your kitchen and on your countertops and will add to any kitchen décor. This is very helpful if you use the unit for entertaining and can also double as a hot plate, keeping food warm, during serving. The Waring DB60 has a heavy duty housing with non-slip rubber feet. This will keep the unit steady and prevent it from moving during the cooking process. It is, however, necessary to keep the cooker on a flat surface so pots do not tip. Each burner features an indicator light that will tell you when the burner is on and when it has reached the desired temperature. There are 5 temperature settings for each burner and they are individually controlled. The large burner is 7 ½ inches in diameter and provides 1300 watts of power for cooking. This is powerful enough to boil a pot of water, keep oil hot enough for frying and provide enough heat to sear meats. The smaller burner is 6 inches in diameter and provides 500 watts of power. This is effective for keeping foods warm and low temperature cooking like simmering sauces. The total size of the double burner is 19 ½ X 11 ½ X 4 inches. This is small enough that it does not take up much storage space yet large enough to cook with standard size pots and pans. The power cord is 40 inches long. The double burner cooktop is frequently used in motorhomes and RV’s, in college dorms, and as an extra cooking plate while you are entertaining. It can also create extra burners for outdoor cooking and entertaining. For the best cooking results turn the burner on high, without a pot, for around 4 minutes. Then adjust to your preferred cooking setting. This will provide a hot burner to begin your cooking. The first time you use the unit the burners may smoke. This is considered normal. To clean the unit use a damp but soft cloth to wipe down the surface of the burners and the housing. Do not use abrasive cleaning brushes or steel wool pads as this will scratch the surface and could damage the burners. The burners are sealed, but should not be immersed in water or separated from the housing. The Waring DB60 Portable Double Burner Cooktop comes with a 1 year warranty. Customers love that the power of the burners are able to boil water and fry foods. This is a great product for outdoor cooking, camping and small spaces like dorm rooms. The biggest objection is that it takes several minutes to heat up. However, after the unit has heated you are able to cook nearly any food successfully. Customers also like that this unit is very heavy duty. The stainless steel finish is attractive and fits with the décor and the burners are very sturdy and can hold standard sized pots while keeping them stable. The larger burner heats up with 1300 watts where the small burner only has 500 watts of power. This makes the larger burner very useful for boiling water, sautéing, frying and other general cooking needs, whereas the small burner is best for keeping foods warm and cooking that does not require as much heat. 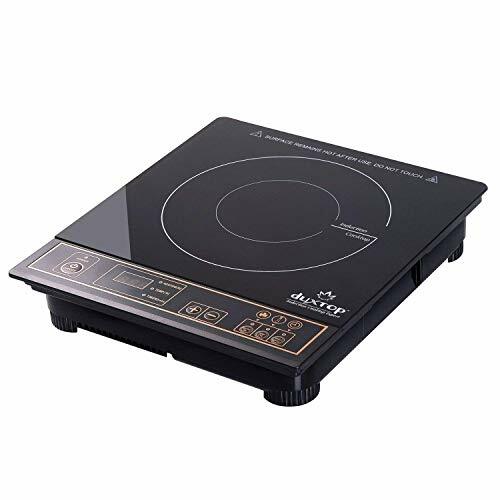 The DUXTOP 1800 Watt Portable Induction Countertop Burner 8100MC is a top pick because it is an induction cooktop that provides 1800 watts of power. This single burner unit is both lightweight and compact, providing for easy storage and portability. The control panel is all digital. The panel includes a temperature range from 140 degrees to 460 degrees with 10 different temperature setting options. This will allow you to warm food, sear, fry, boil water and virtually every other stove top function you need. The power levels range from 200 watts to 1800 watts and also features 10 different settings to choose from. For those new to induction cooking it will take some experimenting with the wattage and temperatures to find the most comfortable settings for your temperature needs. Generally stoves do not have the ability for such precise temperature settings. Other valuable features include a timer that will count down and can be set for up to 170 minutes or almost 3 hours of cooking. It also comes with a 6 foot cord which is long enough that you can place the cooktop conveniently. The DUXTOP 1800 Watt Portable Induction Countertop Burner 8100MC comes with an auto detect which will detect if a pan is on the burner. When the pan is removed for more than 60 seconds the unit will automatically shut off. There is also a safety feature overheat function that will turn the cooktop off to prevent overheating and power surges. The cooktop is easy to clean and generally only needs to be wiped down with a damp cloth. The burners are self-adjusting and will only heat the burner based on the size of the pot or pan. This feature increases efficiency and results in 90% of the energy being used to cook the food. The unit will not heat up the kitchen and will result in using less energy and faster cooking times. The Duxtop unit also comes with a one year warranty. Induction cooking is different from electric or gas cooking and uses a magnetic field to generate energy. This energy heats the pan directly, which then heats the food inside the pan. Electric stoves heats the burner, which then heats the pan, which heats the food. This different process results in faster heating and faster cooking, more like a gas range than an electric stovetop. As a function of induction cooking, not all pans will work on the cooktop. Pots and pans need to be cast iron, stainless steel with a magnetic bottom or enameled cookware. The best way to determine compatibility it to take a magnet with you when you shop for the pots and pans. If the magnet stays on the bottom, then it will work with the induction cooktop. Customers love that the induction cooktop heats up so fast and then automatically shuts off when the pot or pan is removed from the burner. Customers say it heats up and cooks faster than a gas stove, without the open flame. The other features customers rave about is the exact temperature settings, which allows you to cook foods like candy, which needs a specific temperature. The only complaint is that the unit has a fan, which is required to keep the magnets cool. This fan gets louder at higher temperatures, meaning you have to accept the sound of a fan running during the cooking process. The fan will continue to run for a few minutes after the unit shuts off, this helps to cool the unit down. The other key to any induction cooking is that you must have specific pots and pans to cook with. Customers suggest that you bring a magnet with you when you shop for cookware. If the magnet works on the bottom of the pan, then it will work with the induction cooktop. The Rosewill-1800-Watt-Induction-Stainless-RHAI-13001 cooktop is a top pick because this induction cooktop comes with 1800 watts of power. There are 8 power settings with the Rosewill-1800-Watt-Induction-Stainless-RHAI-13001 cooktop ranging from 300 watts to 1800 watts. The temperature settings range from 140 degrees to 450 degrees and also comes with 8 settings to choose from. The digital touch control panel features a countdown timer with a time limit of 3 hours and an LED display that is easy to read. 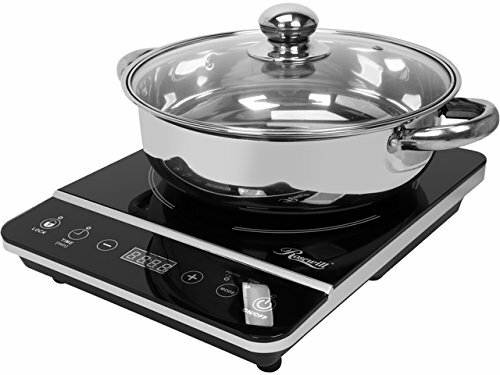 The feature that makes the Rosewill-1800-Watt-Induction-Stainless-RHAI-13001 cooktop stand out is the stainless steel induction pot that is included with the purchase. If you are just getting started with induction cooking, having a pot that will work with the induction burner can get you started. Once you get comfortable with this form of cooking you can choose a cookware set that will best meet your needs. The induction cooktop has a polished crystal plate that is very attractive. The unit is small enough to store on your countertop or in your cabinets. The unit is only 13.6 X 10.6 X 2.4 in size. The burner has two burner sizes and will adjust based on the size of the pot. The larger cooking surface is 9 inches in diameter and the smaller is 5 inches. This help reduce the heat and energy used and will speed up your cooking times. Cooking with the induction method is different from either electric or gas. Induction cooking uses a magnetic field to heat the pot directly. This method saves energy and reduces cooking time and resembles the heat up and time that gas provides, without the open flame. With induction cooking 90% of the energy produced is used to heat and cook the food, leading to very little lost energy. This will save you both time and money. Because induction cooking uses a magnetic field not all pots and pans will work on the cooktop burners. Cast iron, enamel and stainless steel with a magnetic bottom all work with induction cooktops. Taking a magnet and seeing if it sticks to the bottom of the pot or pan is the easiest way to determine compatibility. Customers love the induction cooking and the fact that it does not heat up the room with use. It also has an automatic shut off when a pan is not on the stove top. The wattage is high enough to cook anything from spaghetti to fried chicken and the unit is lightweight and takes up very little space. Customers would love to see a carrying case included to make it easier to transport. This unit is used in RV’s, dorms, at work for cooking fresh lunches, and as an extra burner at home. While the pot that is included is not a high quality pot, for those without induction cookware, it is nice to have a pot you can start with. Portable cooktop stoves are very popular with consumers and the first choice is whether you want an electric or an induction cooktop. Both units are plugged in and use the standard electrical current. The key different is in how the unit heats your food. Electric units are what most of us are familiar with because it is the same cooking method used at home. The appliance heats the burner, which then heats the pot, which cooks the food. Induction cooking is gaining in popularity because it is a cooler source of heat, yet the unit heats up very fast. Induction cooking uses a magnetic force to heat the pan directly without heating the burner. This feature saves energy and the units use very little energy. The pot gets hot very quickly, like a gas stove, without the open flame. These features reduce kitchen heat and saving both time and money. The other key choice is a single burner or a double burner. Most companies make both styles available to consumers, along with the three featured cooktops. With all units the burner temperatures are spread over the total amount of energy the unit can produce. The Waring has two burners and the large burner can use up to 1300 watts and the smaller burner can use up to 500 watts for a total of 1800 watts. Double burners for induction cooking works the same way. The total wattage is divided among both burners. This means you could only get 1800 watts whether you are using one or two burners. When the second burner is used the watts can be distributed based on your needs. 1500 watts for one and 300 for the other, or 1000 watts for each burner. If you need the higher wattage for most of your cooking needs, buying two single burners will be more useful than the two burner unit. Waring offers an electric unit with 1800 total watts across two burners. 1300 is on the larger burner and 500 for the smaller one. The Duxtop and Rosewill are both induction units that offer 1800 watts in a single burner. The Waring unit features knobs to control the temperature with 5 different temperature settings. The Duxtop is digital offering 10 setting options for both the temperature and the wattage. Temperature ranges from 140 to 460 degrees, providing the highest temperature settings available of the three units. The wattage ranges from 200 to 1800 watts. Rosewill offers 8 different temperature and wattage settings ranging from 140 to 450 degrees and 300 to 1800 watts. This unit also has a digital interface which is easy to set. Both the Duxtop and Rosewill units also have a countdown timer. The Duxtop has a maximum time of 170 minutes and the Rosewill has a maximum of 3 hours (180 minutes) for the timer. Both induction units offer overheat protection, which protects the unit and cuts it off if the cooktop gets too hot. The Duxtop offers an auto sensor that will determine the size of the pot or pan being used and will only heat the burner to the edge of the pot. It also has a sensor that will turn the unit off if a pot has been removed for over 60 seconds. Both units have a fan that operates when the unit is on and will run for several minutes after cooking has finished in order to cool the motor. Resewill offers two different heat sizes for the burner which can be adjusted based on the pot size. It also is unique in that it comes with your first pot. Given the need for special cookware with induction cooking, this can be an added benefit for those just starting out using the induction cooking method. What is a Portable Cooktop Stove? Portable cooktops used to be called hot plates. It generally is a single or double burner that can be heated and used to cook food. There are various heat sources available for cooktops which all have different benefits. The most common heat source is through either electric or induction. Other popular heat sources include propane, kerosene and other sources that do not require an outlet. These are often used for camping or day hikes to remote areas. With most campgrounds offering electric, the plug in units are popular for both home and camping use. A closer look at how the cooktop will be used will help decide if you want a double or single burner. The double burners are larger and need a larger place for non-use storage. The advantage of a double burner is that you can cook meats and sauces at the same time. You can cook one item, and keep it warm while you cook a second item. Double burners are also convenient when you need to keep two items warm during entertaining. The key is that both burners do not operate at the same heat level. Each unit will have a maximum wattage and that will be divided among both burners. Single burner units generally offer a higher total wattage because it is not divided power between a second burner. They are also smaller and more compact for storing. If you plan to use the units a lot and feel you need the higher wattage then buying two single units will be more beneficial than a single double burner. Note that the double burner units are not significantly more expensive than the single units. If you will be using two burners frequently and do not need them at full power, then the double units will be more cost effective, if it meets your temperature needs. One of the deciding factors for the size cooktop you will get may depend on the space you have available for storage. If you are in an RV, hotel or dorm room space is at a premium. Storage should be considered before deciding whether you want a single or double unit. Electric Cooktops are the most common form of cooktop stoves. These burners operate just like the standard home stove and can be used anywhere there is an outlet. The temperature settings are generally high, medium, low, and possibly warm and/or simmer settings. The advantage of these is that they do not use as much energy and will not heat your home like a standard stove. They are also the cooking method most are familiar with. Induction Cooktops are gaining interest among many home cooks. They are cooler than the electric models and heat fast like a gas stove. The units are very energy efficient and are safe for children because the units do not get as hot as an electric unit. Most induction cooktops offer digital readings for both temperature and wattage used. This takes a little getting used to, but offers more exact temperatures for cooking foods that need to be fried, candies, and other things that need a specific temperature to be maintained. The induction cooking also has a very fast recovery time. When you add foods the temperature lowers and how fast it recovers can determine the quality of the finished food. Kerosene Cooktops have a very high heat output. Kerosene is a fuel that is widely available and inexpensive making this a popular choice for survivalists and campers. The one downside to kerosene is that the cooktop must be primed before use and kerosene has a very distinct smell that many do not like. The smoke that is produced from its use is sooty and if there is a spill it does not evaporate quickly. If you already use kerosene lanterns, then this would be a great choice as an added source for cooking. Propane Cooktops are also popular for camping enthusiasts. Propane is readily available and easy to use. You can use small portable propane canisters and that will provide enough fuel for most cooking needs. The propane canisters are sealed and do not leak. They are compact and easy to carry and can also be used in lanterns and with other camping gear. Some propane canisters are refillable adding to the cost efficiency. When empty canisters are thrown away they need to be disposed of properly. Price is not always indicative of the quality of the unit. Often the price is determined by the number of features the stove offers. The more bells and whistles the higher the cost. Evaluating which features you want the most will help you select a unit that will meet your needs at the lowest price. Also consider construction. High quality units will use heavier and thicker metals and will be sturdier. With a portable unit having features like non-slip feet and auto shut off are safety features that may be worth more than say a timer. When looking at the price of the unit consider the upfront cost as well as operating costs. Buying portable fuel sources like kerosene or propane require ongoing fuel costs. With electric the 1800 watt units, if used frequently will be paid for in power bill costs. Using the unit in place of a stovetop will generally use less power. Induction units also use less power than electric units because there is very little lost heat and cooking and heat up times are faster. Most portable cooktop stoves can be cleaned with a wet rag. Review instructions for things like using abrasive material and where the unit cannot get wet. This will help the unit last longer and will protect the internal components that operate the machine. Things like sealed burners will help ensure that wiping the unit down will not leak water into integral parts of the cooktop. Digital settings, timers and automatic shut offs are common features found in cooktop stoves. Review the list of features available and determine what is important to you. If you want a stove like cooktop then high, medium, and low settings may be all you need. If you want to fry chicken wings more specific settings may be easier to monitor. Timers are good to have, but not essential to your cooking if you watch your food. If you tend to multi task, then the timer may be a must have. Cooktops are popular in home kitchens because they are convenient and versatile. Whether you are cooking for one and do not want to heat up the kitchen, or love the outdoors and use it for camping, cooktops are a great appliance to own. Newer models offer more features and are built to last for many years, when properly cared for. Add a cooktop to your appliances and you will find that you use it more and more. They are compact and store either flat or on their side, making it so they take up very little room. You can enjoy cooking outdoors and in small spaces with the use of a cooktop stove.